Well today finds Grinder and I on the couch. He is attending me very closely, he wants to be fed, me checking computer updates, thanks Uncleweed for the tweet of this http://ow.ly/17zPw. TV just talking about our GOLD and no snow, 8,000 tickets "Vanoc cancels standing room tickets for snowboard cross events". Well it's 2:11 still scanning negatives, hope everyone stayed safe at the homeless rally at noon. Police and boarder police came to W2 last night. Did they come to see my D.O.A. photos on the Mezzanine level of the ground floor. I think not. 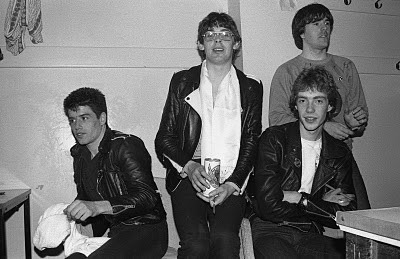 Here is one of the Stiff Little Fingers photo from Malvern, England July 1980. I am getting some photos together for a second book being published about them. I have still been scanning photos, The Skinny is interviewing DEVO Tuesday and I am sending in a photo from Jun 24, 1979 when The Pointed Sticks opened for DEVO. I will be going out Tuesday after I change Grinder's kitty litter. Yes Grinder I will do that tonight, yes. Done. These are the new stamps Jane gave me, the Gold medal win. We have 1 Gold, 2 silver, 1 bronze total at the end of day 4. Grinder and I are on the couch again.